Eid-ul-Azha, the festival of sacrifice is being celebrated with religious fervour and gaiety across the country today. The faithful will offer Eid prayers in Eidgahs and mosques. 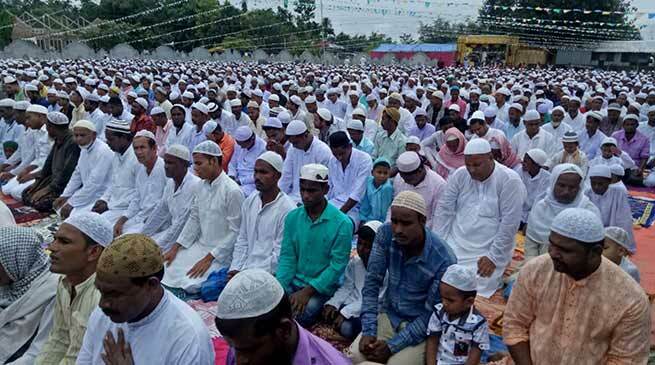 Along with rest of the country the Eid-ul-azha was celebrated among the Muslim people in Kokrajhar with pomp and gaiety. Special namaz were held at different mosques and Iddgahs in different parts of the district in places like Bhotgaon, Salakati, Jaipur, Fakiragram, Chilita and Gossaigaon. People following Muslim faith were seen thronging tin the mosques and idgahs for namaz and pray for peace. It is also known as the Feast of the Sacrifice or the Greater Eid. The celebration revolves around when Allah appeared to Ibrahim in a dream and asked him to sacrifice his son, Ishmael, as a sign of his faith. Talking to reporters Imam of Kokrajhar Jame Muzid said that in this holy days they seek peace and harmony among all section of people, never be happen communal violence like 2012 in BTAD so they pray for Allah. MLA Pramila Rani Brahma state minister, Hagrama Mohilary Chief BTC and AAMSU President of kokrajhar district Safikul Islam extended Idd greetings to the people of Assam on the occasion.